Commodities are supposed to buffer a portfolio from inflation, but years of low inflation have made commodities laggards in a broadly diversified portfolio. We're here to remind you why commodities still belong in a portfolio, even though they've been stinkers for years. 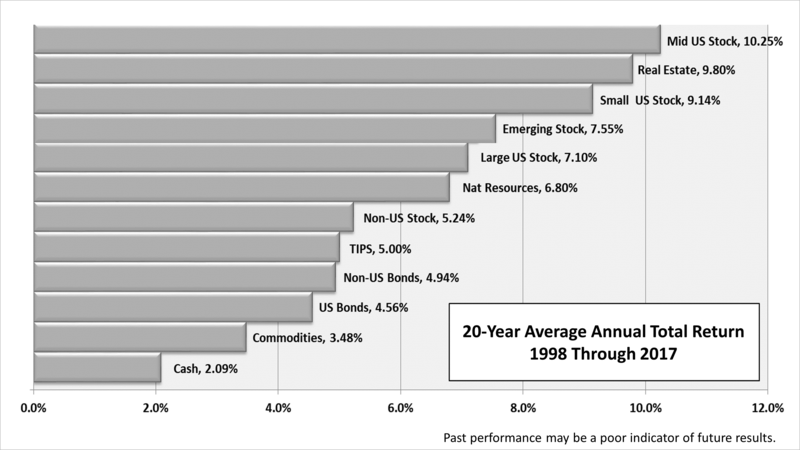 Over the past 20 years, in a portfolio with 12 distinct types of securities, commodities delivered just a 3.48% average annual return. Only cash was worse, at 2.09%. Meanwhile, U.S. stocks delivered an average return annually over the 20-years two or three times that of commodities. Stocks and commodities are negatively correlated. When one zigs, the other tends to zag. Of course, for short spells commodities performed well, usually because of a rise in the price of oil. In 2014, for example, oil topped $100 a barrel before plunging in 2016 to $28, and it recently hovered at around $60. Its price made shares of commodities-related companies behave totally different from the broad U.S. stock market. For perspective, the table shows how core asset classes performed since 1970, when accurate performance statistics on an index of a commodities company shares was first tracked. The 48 years have been defined by two cycles of inflation. The first 24 years were high inflation years, while the second 24 years were characterized by low inflation. Commodities, before adjusting for inflation, averaged an annual loss of 1.97% in the 24 low inflation years, while their "real" adjusted for inflation return, after subtracting the rate of inflation based on the Consumer Price Index, lost an average of 4.03%. In the low-inflation time, stocks were the winners, with large stocks notching a nominal 10.8% average annual return. 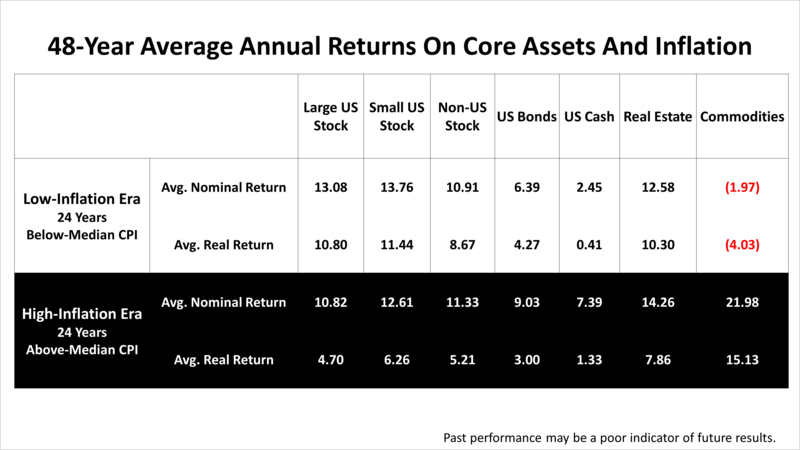 Even cash, at a 0.41% real return, averages a higher return than commodities. However, in the high-inflation period, it's commodities that were the champs, gaining 15.13% after inflation - three time as much as large and small-cap U.S. stocks. Bonds and cash suffered the most, with 3% and 1.35% respectively. No one is expecting a high inflation period like the one in the 1970s anytime soon. However, the cycle of low inflation changed in 2018, as the economy grew and signs of a tightening in the labor market began to appear. The Federal Reserve, the nation's central bank, says it expects the inflation rate to rise to 2% in the second half of 2018 and is planning on raising interest rates several times. With the risk of higher inflation growing at this point in the economic cycle, commodities remain important in a diversified portfolio, even though they have been stinkers for a long time.